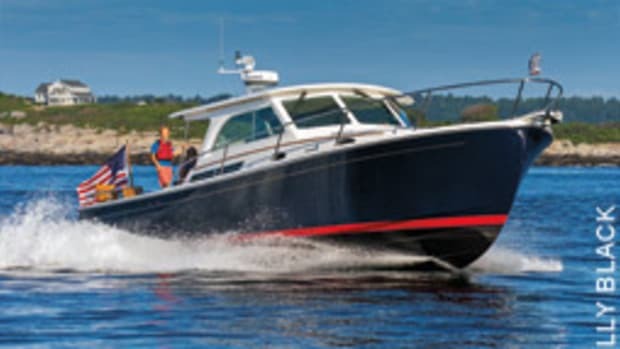 In 1994, the owner of Maine-based Sabre Yachts acquired North End Marine, a big player in making marine molds and fiberglass parts at its plant in Rockland, Maine. 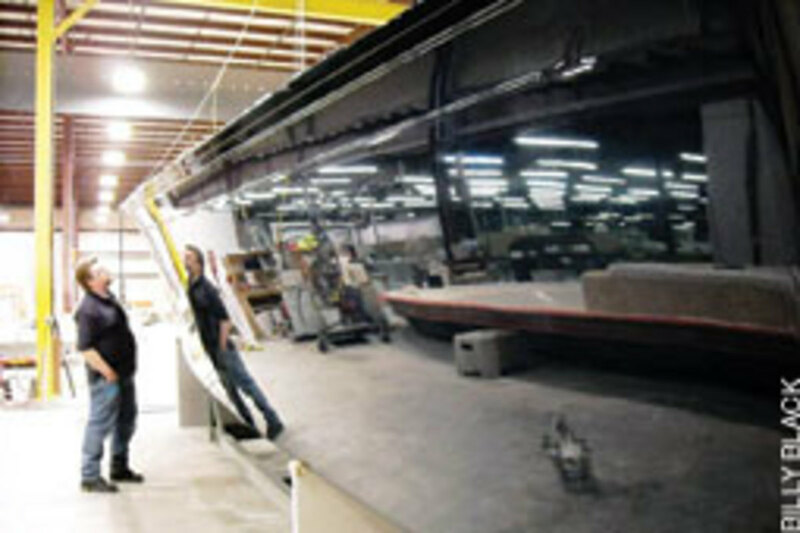 Now called North End Composites, the company produces hulls and decks for Sabre&apos;s larger sail- and powerboats in its 240,000-square-foot facility. It also builds powerboats from 30 to 37 feet for its Back Cove Yachts division. 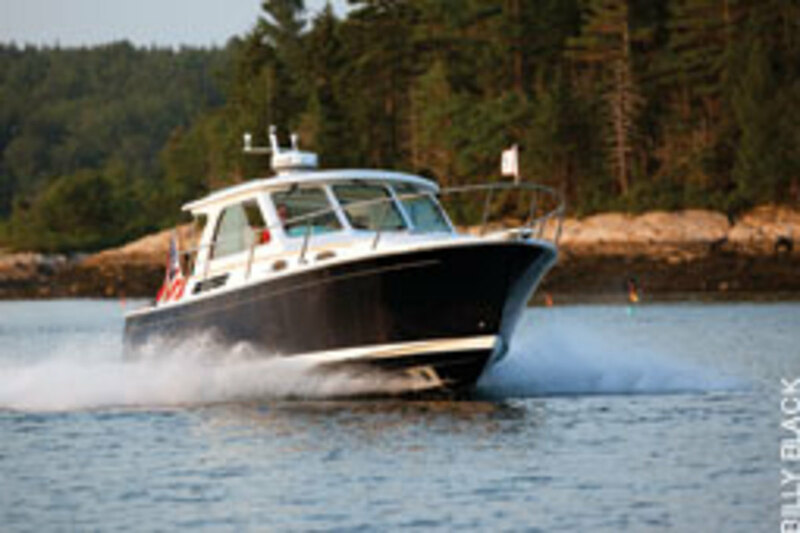 Although Back Cove is the less expensive brand, there&apos;s nothing Plain Jane about the way these single-diesel boats are built or outfitted. The company uses a vacuum resin infusion process to produce the excellent structural integrity one comes to expect from this method, along with - and here&apos;s the surprise - a cosmetic profile that makes the hulls look as if they were hand-laid. And that&apos;s saying something. When the infusion method is used, the laminate is under so much pressure from the vacuum and the heat during the resin cure process is so high that the pattern of the fiberglass reinforcement is telegraphed through to the gelcoat. This print-through, especially noticeable in dark hulls, is ordinarily something one lives with, the build quality being the owner&apos;s consolation. The alternative is usually to laboriously sand and paint the hull after it comes out of the mold, which naturally adds to the cost. Let&apos;s take a look at how Back Cove achieves both character and beauty in its boats - all in one shot, so to speak. Resin infusion uses a vacuum to draw the liquid resin from a barrel through a stack of several layers of dry fiberglass reinforcement, creating a composite part, whether a hull, deck or small part. A plastic bag covers the part being infused, and it is compressed against the fiberglass during the infusion process, which helps ensure a solid, continuous bond between the fiberglass and any core material used. Done correctly, resin infusion produces high-quality fiberglass parts with consistent resin content and part weight. 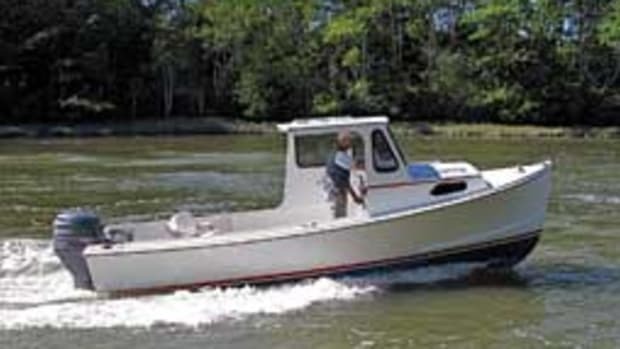 Part weight is generally on par with or less than high-quality open-molded boats. Also, structural integrity is enhanced when the stringers and bulkheads are infused at the same time as the hull skin and when resin is allowed to flow unimpeded to both sides of the core, creating a solid skin-to-core bond line. I went to Back Cove&apos;s Rockland facility to see how the company approaches the resin infusion process and get a better idea of how the crew does it so well. On the day of my visit, the project at hand was the infusion of a 30-footer&apos;s deck, a much more complex component than the hull since it has so many different surfaces, angles and other irregularities. 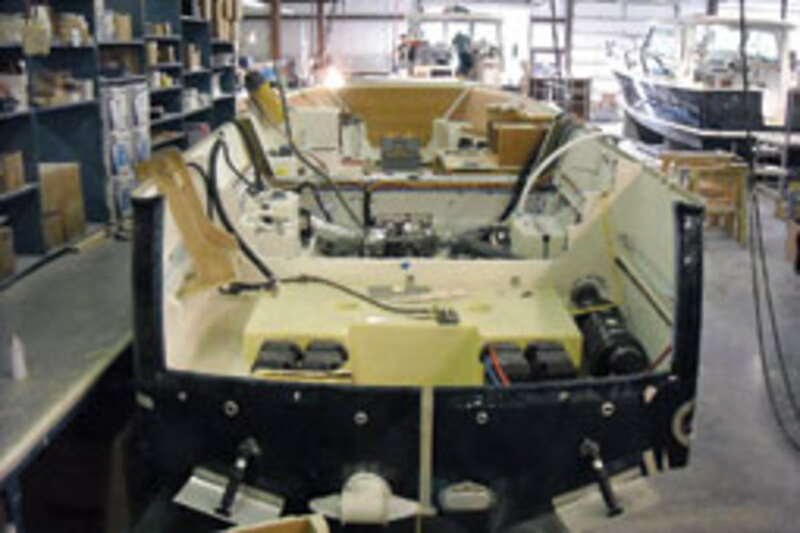 A conventionally built open-molded boat is fabricated with multiple layers of fiberglass reinforcements that are wet out one or two at a time with buckets of resin or spray guns and rollers. 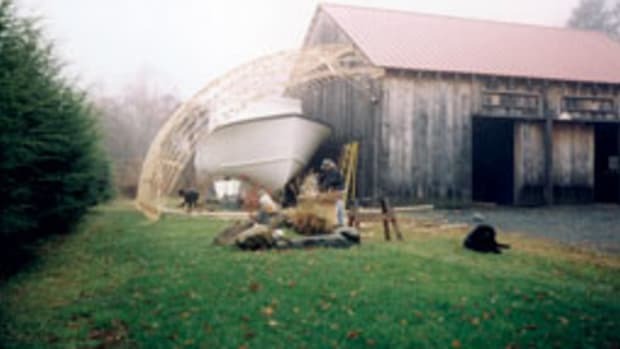 This is the method production boatbuilders commonly use, and it produces a solidly built structure, although parts usually will be a little heavier because the resin content is higher. (It&apos;s hard to squeeze out the excess.) The builder has to be careful to manually achieve a good outer skin-to-core bond line with cored parts, which is sometimes done by vacuum bagging. The resin infusion process, on the other hand, uses a powerful vacuum to evenly draw the resin through the laminate, completely saturating the fiberglass and core material. The vacuum pressure also compacts the laminate "stack" (the inner and outer fiberglass skins and the balsa or foam core in between) inside a plastic bag while pressing it firmly against the mold until the resin has been thoroughly distributed and cured. Back Cove produces the outer fiberglass laminate using the vacuum infusion process, or VIP, developed by Intermarine, with extra continuous filament mat that is stronger than chopped strand mat. Adding the continuous filament mat adds weight to the laminate because it holds more resin, but unlike other infusion processes this produces a nearly flawless fiberglass gelcoat finish, or profile. The boats I saw on the line, in fact, showed no signs cosmetically - the print-through effect - of being infused. The vacuum creates a very high pressure of about one atmosphere, or 14 psi. It&apos;s interesting to compare VIP with other infusion processes, which can produce a lighter-weight part with a fiberglass-to-resin ratio by weight of about 65-to-35, or even 70-to-30 if you really draw it down. However, dark-colored hulls, in particular, must be long-boarded (sanded using long sanding pads to uniformly knock off the high spots) and then painted to produce a satisfactory look. With VIP, figure on a glass-to-resin ratio of about 50-to-50, which will add weight but also will provide the bulk needed to pretty much eliminate print-through. VIP still has a very respectable stiffness-to-weight ratio, with no need for post-cure sanding and painting. The glass-to-resin ratio for open-mold building can be anywhere from 40-to-60 to 25-to-75, which is a more resin-rich laminate, depending on how careful the laminators are about squeegeeing out excess resin. But if too much resin is squeezed out, the laminate can be too dry, without enough resin remaining to fill the voids between the layers of reinforcement, or with too much vacuum pressure compacting the laminate excessively, reducing its strength and stiffness. The resin is what keeps the fiberglass filaments in column and fixed in relation to other filaments and rovings when the laminate has set, so an amount of resin within an appropriate range must be used. Although a filament is just as strong in tension whether it&apos;s encapsulated in resin or still dry on the roll, it has no value whatsoever in compression or shear, absent the resin matrix. Obviously, fiberglass parts are subject to shear, compression and tension as structural components, making the resin vital. A little extra resin is also not a bad thing since it results in a thicker stack, or overall laminate, and thickness determines stiffness and helps improve impact resistance. But too much resin results in a brittle structure. Like the best open layups, Back Cove finds a middle ground in terms of resin. It uses high-strength, high-elongation and highly blister-resistant vinylester in the hull skin coat and a polyester skin coat for the deck. The rest of the laminate is wet out in a DCPD (dicyclopentadiene) resin blend that, although not as strong and more brittle than vinylester, is plenty good for this application and has the benefit of shrinking less during cure, which further minimizes print-through. Back Cove went from a glass-to-resin ratio of 25-to-75 to 50-to-50 with the VIP process. "We got the lighter, stronger parts we were looking for," says Jason Constantine, Back Cove&apos;s chief operating officer. "We also get excellent part quality and consistency from one boat to the next [because] we use the exact amount of resin from one part to the next. We also get to market the improved structural results, along with a greener manufacturing process." The infusion process has a few quirks, although none are terribly meaningful. For example, it&apos;s very difficult to keep the stringers perfectly straight when they are under such high vacuum pressure during the building process. However, the little bit of distortion I saw will have no practical impact on strength, while the primary bond - the stringers are infused at the same time as the hull skin - helps maximize structural integrity. Back Cove is one of the few builders coring its boat bottoms, which I think is one of the most rational applications of the resin infusion process. Many builders fear cored bottoms, not so much because they are structurally inferior but because boat buyers think they&apos;re a bad idea, occasionally for good reason. Through the years, inept or imprudent builders have cored the bottoms of their boats using open-molding processes. Sometimes the core wouldn&apos;t bond securely to the outer skin, and it would flop around unsupported. When water made it through errant fastenings or through-hulls in bottoms cored with balsa, the whole bottom turned to mush. An infused balsa-core bottom is more resistant to water migration because the voids between the balsa sections are filled with resin, but I still would avoid its use in this area below the chines. I personally look at balsa in the bottom of a boat as a potential time bomb, and many builders share my view and opt for solid glass bottoms. They are heavier and generally bulletproof in terms of structural integrity. And if you&apos;re going to have a heavy section of the hull, the bottom is the best place for it, both for center of gravity and impact-resistance properties. You can also build a solid bottom lighter (using a thinner laminate) by supporting it with a bottom grid that divides it into lots of small panels, but that&apos;s another story. 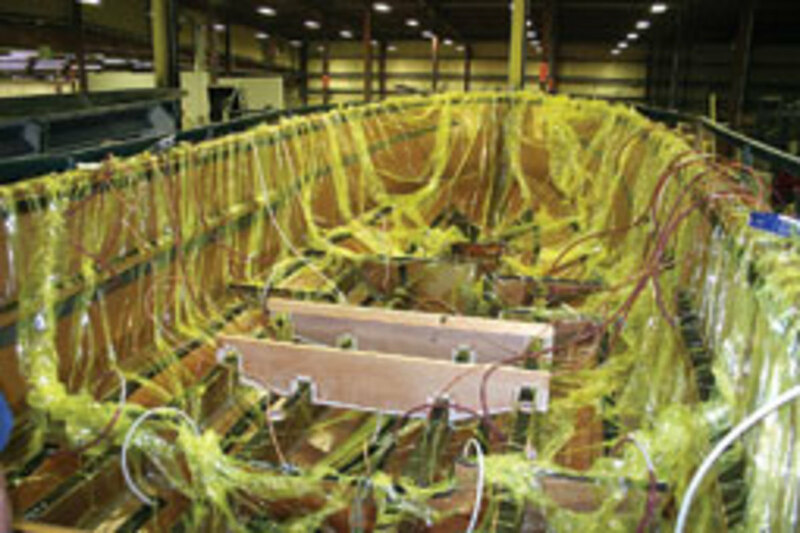 Back Cove uses Core-Cell cross-linked polymer foam in its cored bottoms, and the foam is perforated to improve resin dispersion to the outer skin/core bond line during infusion; balsa is used in the decks and deckhouse. Although the foam can theoretically delaminate at a resin-starved skin/core bond, it will not turn to mush, and, most importantly, the VIP infusion method produces a rock-solid outer skin/core bond line. The builder also uses a high-density composite, called Coosa or Penske board, to replace the Core-Cell around the through-hulls. This composite material is hard and resistant to compression when the bolts are tightened, and it is non-absorbent and impervious to rot. The core stops 6 inches short of the hull&apos;s centerline, so the keel area is solid glass, with the port and starboard laminate stacks overlapping to double the amount of glass in this area. The bottom, in fact, is the part of the hull that benefits most from coring since it must be stiff, strong and impact-resistant without being heavy. These properties are exactly what proper coring methods and materials produce. Using foam in the bottom also creates a less brittle structure, absorbing impact loads more efficiently and effectively while lessening the chance of a hull laminate fracture. The hull sides are solid glass (coring makes stopping print-through harder), with a 4mm bulking ply layer helping to prevent print-through while adding thickness and stiffness. Making the hull sides using the VIP process eliminates the need to sand and paint after the hull comes out of the mold. A 4-by-4-inch foam-cored longitudinal stringer stiffens the hull sides. These boats are intelligently engineered in terms of materials beyond the basic lamination process. For example, Back Cove uses a higher-density Core-Cell foam in the forward section of its hulls, which makes this area stronger and stiffer. This is where wave impact loads are the highest and there is less room for structure (such as stringers and bulkheads) because of the close proximity of the cabin sole to the hull. The resin used is specifically formulated for a 90-minute infusion period, so there is time to ensure complete wetting out of the laminate to eliminate dry spots that might remain at the end of the process. Back Cove has worked with its resin and fiberglass vendors to produce specific materials that suit its infusion method. The building process is systematic at Back Cove, which is producing a 30-footer every six working days. On Monday, the mold is sprayed with gelcoat, a thick paste that hardens and gives the hull or other parts color and a smooth outer appearance. The hull surface will mirror the female mold it&apos;s laid up against, although there is more to it than that. Next, a layer of fiberglass chop wet out in vinylester resin is sprayed on over the gelcoat to a thickness of 2 ounces per square foot. The builder kits (precuts) its own fiberglass reinforcements, and the core vendor provides the coring kits. Kitting the materials to the right size and shape means they lay right in place, precut to fit, which speeds the building process. After the gelcoat and chopped skin coat cures on Monday, the dry-stack laminate is applied on Tuesday and Wednesday. The vacuum bag is set and sealed in place on Thursday and Friday. The continuous filament mat comes prestitched to the reinforcement, and it stands up well to compression while adding stiffness and bulk to the laminate. It also reduces print-through. A heavier reinforcement is used to quickly bulk up where there will be no coring - just solid glass - such as at the toe rails. The reinforcements are selected for their ability to double as a resin-flow medium, rather than adding a throwaway material over the laminate. Balsa core is used in the deck to increase stiffness while minimizing weight. When all of the reinforcement is in place, a vacuum-infusion film is placed over the whole mold and sealed around the perimeter. Vacuum connections and resin-infusion lines are attached to the bag. The exact location of the vacuum and infusion hoses results from careful analysis of the shape and size of the part, and these locations are further refined as the first few parts are infused. If a section of the part takes a long time to wet out, hoses might be added or moved, or the feed lines might be rerouted until the infusion process is optimized in terms of resin flow and time. Once the bag is sealed and the hoses are in place, the part is ready for infusion. There are tricks to the infusion trade besides knowing where to put the vacuum and resin lines. For instance, feed lines are placed over the dry stack before the bag goes on. The resin flows through these strips of flow media faster than it does through the laminate, hastening resin dispersion. Frank Chandler, North End Composites&apos; lamination supervisor, manages the infusion process. He also has a lot of experience with the SCRIMP process. Chandler says the flow media can disperse the resin about 30 inches, so that drives the spacing of the feed lines, which are removed after the part cures. "This is one of the biggest differences with SCRIMP, which is more time-consuming to set up and needs to have a flow medium added on top," he says. "We also like VIP because it uses the CFM [continuous filament mat] in the laminate, along with the feed lines, to distribute the resin. While the resin content is a little higher than with SCRIMP, it&apos;s still very low, producing parts that are 10 to 15 percent lighter than open molding." Chandler notes that the result is a boat that&apos;s 5 or 6 percent lighter overall. The structure is very sound, with no voids in the laminate, as is the skin-to-core bond. "We are a low-volume builder, so we feel this is the perfect process for us," he says. "What this process has done is allow us to offer a lighter, more efficient boat to the customer or add more content [air conditioning, icemakers, etc.] to it without penalty. With the infused hull bottom, we&apos;re also able to add cabin volume since the cored hull skin actually becomes the structure, rather than relying solely on stringers and bulkheads." The order in which the part is infused also matters. The vacuum lines around the trunk cabin and foredeck are opened first, followed by the pilothouse and, finally, the cockpit, which is the last to shoot. If a dry spot appears a few square inches outside the resin&apos;s flow path, the technicians pull the bag folds over the dry spot, which usually does the trick in redirecting the trapped air away from the dry area. If this doesn&apos;t do it, they insert what looks like a horse-sized hypodermic needle to remove the trapped air from the laminate. In the deck I saw being infused, the needle was only needed a couple of times, so they&apos;d pretty well figured out the resin flow path. Resin infused into the deck is recirculated through the laminate until it starts to cure. Only a couple of gallons of waste resin are left at the end. This is another element that makes the infusion process greener than open molding, although all of the plastic bags and hoses that are thrown out after the boat is finished do offset the green aspects. However, the upside is that process uses less resin than open molding, and there is little difference in cost between open molding and infusion because infusion uses less resin. The infusion process takes the builder more time, but fewer people are needed to get the job done. "These are a few of the things that convinced us to start infusing," says Constantine, Back Cove&apos;s chief operating officer. "When we evaluated it, there were clearly more pros than cons to the process for us. The parts are stronger and lighter, and with the resin contained under the plastic bag, it creates a cleaner, more pleasant working environment. 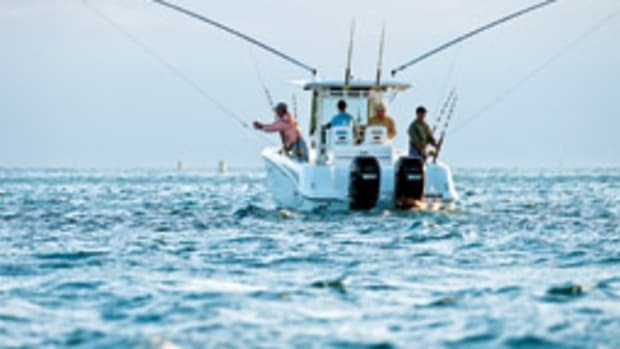 All this is great for our marketing department since it&apos;s both a greener way to build boats and, of course, there are benefits for the owner, who ends up with a high-quality boat. We also like the flexibility the process affords in terms of labor since we can dry-stack the laminate with four people in a couple of days or one person can do it over a longer period to suit their production schedule." Back Cove boats are unusual in that the transom is infused as part of the deck, not the hull. The joint around the transom door has to be post-finished, or sanded and regelcoated after the part comes out of the mold. It&apos;s a lot easier and less messy to do it while the deck is still in fabrication instead of when the hull and deck are joined down the line in assembly. The only odd thing is that there&apos;s a joint at the transom on both sides outboard, but it&apos;s hardly noticeable the way Back Cove puts a fairing strip in to cover the seam. This is an innovation that Kevin Burns, Back Cove&apos;s product development and engineering manager, brought with him when he joined the company. Another nice touch is the way the technicians cut out the cabin liner along the sides forward. It reduces weight by removing non-structural material while leaving just what&apos;s needed to serve as backing battens for the decorative ceiling above the forward berth. The hull laminate is infused much like the deck and so are the stringers and the landings for the bulkheads. This means the primary hull structure is all primary-bonded, which produces a very high degree of structural integrity since everything can be thought of as a single unit in terms of continuity. Back Cove uses cant strips, foam strips cut at a 45-degree angle, at the inside corners between stringers or bulkheads and the hull surface. This means the fiberglass, absent hard 90-degree inside corners, distributes stresses more evenly. The hull stringers are foam-cored, which is a great way to get strength and stiffness at a lighter weight (the same principle as in the foam-cored bottom). Plywood replaces the foam where the stringers become engine beds in the engine room because a denser structure absorbs engine vibrations more effectively. Limber lines from the forward to aft engine room bulkheads keep the area dry, so any gear or engine oil or fuel that spills into the bilge can be contained and cleaned up without being pumped overboard. The longitudinal hull-side stringer also serves to support the wiring above and the plumbing below while keeping them separated, which has obvious advantages. "What we think we&apos;ve been able to achieve is the best possible boat at a reasonable price," Constantine says. "We tend to be a very conservative company and make changes only after careful consideration and extensive research. Infusing our boats simply represents the best practice available." 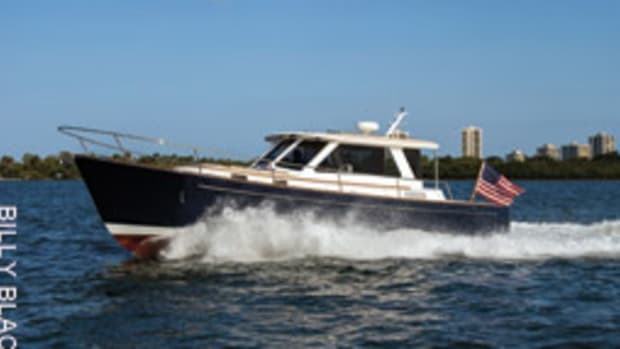 Back Cove uses poly fuel tanks in its larger boats (a 306-gallon tank in the 37-footer). Although aluminum tanks last for decades if properly installed, poly eliminates the possibility of corrosion. This is especially important in a boat that has no hatch above the fuel tank for easy access. The tank is held in place with brackets that slide as the tank is filled for the first time and expands, a step some builders overlook. There are other intelligent design details worth mentioning, too. 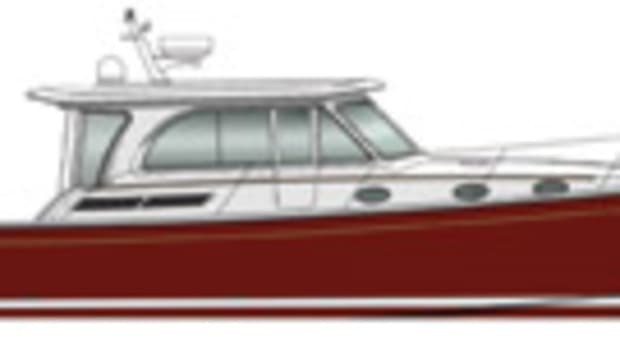 Exhausts exit the hull at the corner of the transom and hull side, which reduces the station-wagon effect by directing exhaust into the air slipstream passing the hull, rather than into the low-pressure area abaft the transom. There&apos;s a large pantry, or storage locker, below the helm. Single diesel power is as efficient as it gets for a 20-knot (cruise) boat, and the propeller pocket design reduces draft while allowing a larger, more efficient prop. The shaft angle on the 37 is a mere 8 degrees, increasing efficiency and reducing vibrations. Back Cove also comes close to matching the radius of the pocket to the diameter of the prop, which reduces the needed prop-tip clearance. However, the 20-inch prop on the 30 is 6 inches smaller than I&apos;d like to see on a boat of this size, not only for midrange efficiency but also for traction around the dock and in heavy seas. A slower-turning 26-inch prop would be my choice. One final noteworthy detail: In the bow, built-in hawseholes in the corners of the anchor locker hatch are a great idea, allowing the rode to be fed back in or pulled out with the hatch closed. There are many excellent open-molded boats being built today to a high standard, but the infusion process, which is really only practical for limited-production builders, is hard to beat. There are ways to make boats lighter than with the VIP infusion method, but not by much, and none that makes them lighter for less cost. Back Cove puts all that resin to work, some of it to produce exceptional cosmetics but most for structural integrity. The lighter weight helps make the boat more efficient, the diesel inboard is very efficient at 20 knots, and you only have to buy and maintain one engine rather than two. With a bit of practice, the single prop and bow thruster will get you in and out of tight spots with little trouble, and there is the option of adding a stern thruster and joystick control. 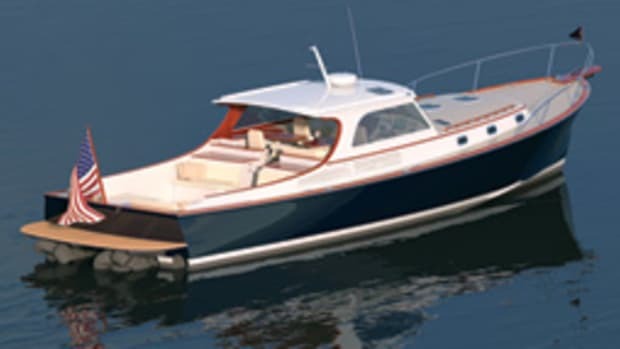 There is a great deal of experience behind the practical design of Back Cove and Sabre boats. There&apos;s no Clorox-bottle-cruiser silliness to be found. What you will find is accessible foredecks, good helm visibility, open cabin layouts, good engine room access, excellent headroom and so on, and it shows in the points already mentioned. Base price for the Back Cove 30 is $209,000; it&apos;s $422,500 for the 37. 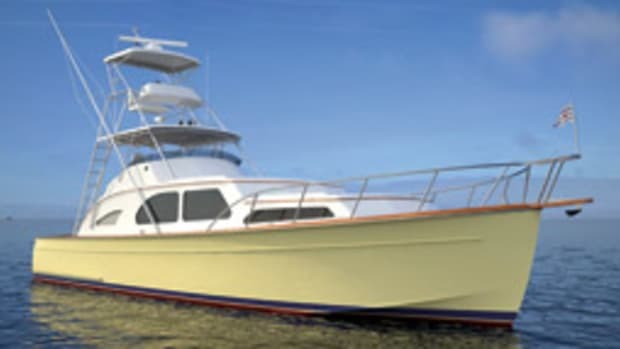 For information about the boats, check out the company&apos;s website at www.backcoveyachts.com.